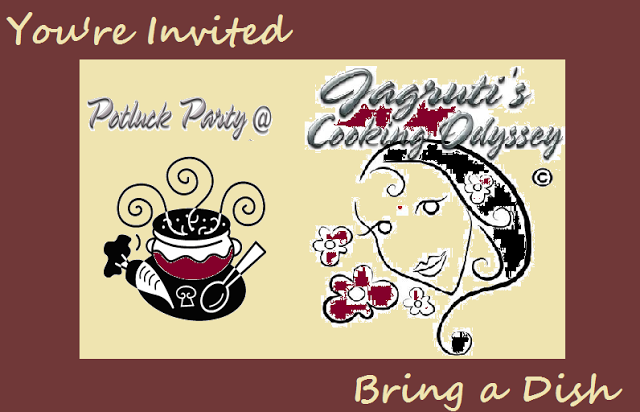 I am so happy to announce that I am guest hosting PJ's event - Cooking with herbs and flowers. This is my first ever event on my blog, so i am very thrilled. We use herbs in our day to day cooking. They enhance the flavor and taste of the dish. One such herb is Spring onion. A scallion or spring onion is one of various Allium species, all of which have hollow green leaves (like the common onion), but which lack a fully developed root bulb. It has a relatively mild onion flavour, and is used as a vegetable, either raw or cooked. Many other names are used, including green onion, spring onion, salad onion, table onion, green shallot, onion stick, long onion, baby onion. They are widely used in soups, noodles, salads and Asian recipes. In Asian recipes, they are part of the stir fry. I love them and use them very often in my stir frys. I have the onion bulbs raw as a part of salad in my daily diet. So lets get into some details of the event. 1. Cook and blog about a Vegan or Vegetarian dish which features spring onion. Though this series is based on the culinary uses, you can also share the following -growing spring onion or tips on freezing or storing them ,non culinary uses that have been tried and tested by you like cosmetic uses, home remedies, crafts etc. You can also write about some interesting facts on spring onions. 2. Please add this announcement link, and link to PJ’s announcement page - cooking with herbs and flowers to your post and hosted by cookingwithpoorni to your post. 3. Adding the logo to your post will help spread the word. 4. Send in as many entries as you wish. Archives entries are also accepted but do make a link to the post with both the announcements. Thank you for supporting Herbs and flowers Event. Let me know if you have any doubts.